You probably already know that Sage HRMS comes with loads of standard and custom reports. Whether it’s for government compliance, payroll analysis, or strategic evaluation of your workforce, here’s a look at some of the Sage HRMS reporting and analytics options you should know about. With over 100 pre-configured reports on Employees, Time Off, Payroll, compliance reporting, and Training, Sage HRMS probably has a pre-formatted report to meet the basic needs of most companies. Simply navigate to the reports section, scroll through the list of available reports, define the report criteria (by date, employee, etc. ), and then print, preview on-screen, or export the data. When you need a custom report that isn't available “out of the box” or pre-configured, then it’s time to look to the Crystal Reports™ writer that’s included with Sage HRMS. With the right skill set, your options are limitless using this powerful tool that allows you to create presentation-quality reports on just about anything in the Sage HRMS database - and in any format you want. Note: Contact us if you’d like to learn about Crystal Reports training opportunities. Another reporting option is the Wizard-driven Sage HRMS Secure Query - a desktop query and reporting tool that allows you to easily generate ad-hoc and custom reports. You can select which fields to output, sort results, build record filters, and group or summarize data. You can then output your query as a report, spreadsheet, or database table. It’s a simple, yet powerful tool for those that aren’t comfortable with the Crystal Report writer. If you’re someone that’s visual - or you just want to take your reporting to the next level - then it’s time to look at SAP Crystal Dashboard Design®. 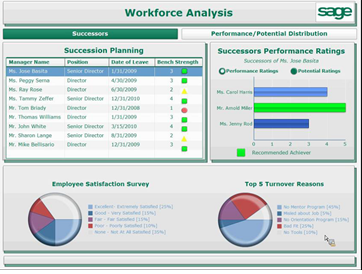 This optional add-on/extension for Sage HRMS transforms spreadsheet data into charts, graphs, dashboards, and visual what-if scenarios that allow you to dive deep and analyze important workforce performance metrics. The stunning visual displays are easy to create using a point-and-click interface. You can even combine data from multiple reports or external sources like spreadsheets and other software systems so you get the full company-wide picture. Need help with your HR Reports? Contact Equation Technologies today if you need help creating, customizing, configuring, or understanding your reporting options in Sage HRMS or Sage Abra Suite. Equation Technologies is a certified Sage partner and an expert is Sage HRMS.